Subject: Production Release 4.8 of JMRI/DecoderPro is available for download. We are very pleased to announce that the 4.7 series of JMRI test releases has resulted in a version that's good enough to be recommended for general use, including by new users. We're therefore making that version, "Production Release 4.8" available for download today. If you are using JMRI on Linux or macOS / OS X and are updating from an older JMRI version, you must open the JMRI preferences and make sure that the selections are correct for your serial device(s). Be sure to save the changes. Or finally, ask for help fixing the file on the JMRIusers list. It's a good idea to keep a copy of the original file as you work on this, just in case. See the JMRI 4.6 release note for more warnings predating the 4.6 development series. These may be relevant to you if you're updating from an earlier version. The full lists of changes in each of the preceding test releases (4.7.1, 4.7.2, 4.7.3, 4.7.4, 4.7.5, 4.7.6, 4.7.7, 4.7.8) are available in our GitHub code repository. DecoderPro now has two additional options for how it handles CV reads and writes. These are set via the Programmer section of the Roster preferences panel. Programming capability facades are little tools that are used to handle things like indexed CVs, special ways to write upper-address CVs not supported by a command station, etc. Previously, these would have trouble recovering when they encountered multiple errors. (This came up in the context of the time that the DCS240 command station takes to do writes, which JMRI thought was an error) This has now been greatly improved. Turnouts now have a DELAYED feedback mode. In this mode, when you command a turnout to move, it first goes to INCONSISTENT state for a few seconds (to give the points time to move), before finishing up in the commanded state. This is intended for cases where you don't have any hardware to specifically read back point position from the layout. Much work was done on the reliability of the C/MRI support, fixing bugs in both setting preferences and normal running. Multiple connections, with the extra ones either identified by a new letter ('K', etc) or a suffix ('C2', 'C3', etc). Each connection has to have its own nodes defined via the preferences screen. The connections can be of mixed type: Multiple serial, or multiple network, or a mix of serial and network. Sensors, Turnouts and Lights can be defined in all the C/MRI connections through the respective tables. You can't (yet) configure start-up actions to work with the 2nd and later C/MRI connections. E.g. if you open a C/MRI monitor in the startup, it'll be using the 1st connection. Some of the labeling and documentation needs to be updated. The C/MRI menu and tools were updated for screen layout and translations (German and Dutch provided). Fixed a bug in DCCppOverTCP throttle message translation. Fixed a problem loading and storing Sensors to panel files. 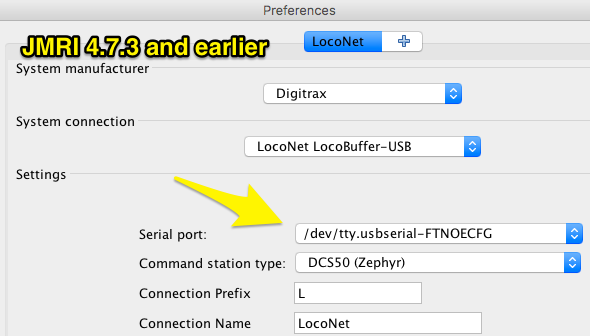 When a JMRI program is configured to use the DCS240 as a standalone programmer, upon program exit the DCS240 will be re-configured as a LocoNet interface. 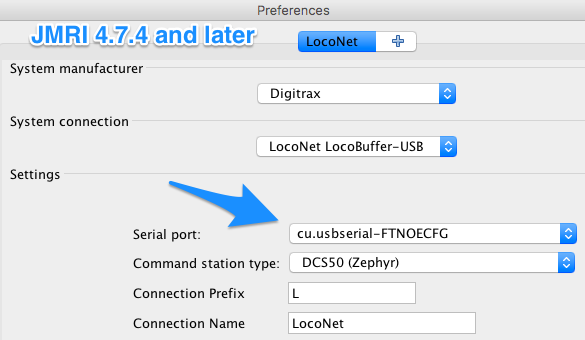 This allows other LocoNet devices to access the DCS240 service-mode programming track after the JMRI program is closed. The Digitrax DCS240 command station sometimes takes a long time to write CVs It's thought that this is happening because it's doing a read-after-write to ensure the right value was stored in the right place. In any case, it takes so long that JMRI was timing out and and retrying while waiting for it to complete. This has now been improved. It's still slow, excruciatingly slow if writing indexed CVs, but the timing is properly handled. The DS64 configuration tool now has the ability to configure the addresses for the turnout outputs, and to configure the DS64 "routes". The server can now be started automatically using the Startup preferences. Server preferences are set in the application preferences window. The server classname has changed to jmri.jmrix.loconet.loconetovertcp.LnTcpServer (any scripts referencing the server will need to be changed). MERG tools were updated for screen layout and translations (German and Dutch provided). Paul Bender fixed an addressing problem with Roco Handheld throttles. Paul Bender improved the Z21 support. Programming of Accessory Decoders on the Main (Accessory Decoder Ops Mode) is now possible, if supported by the decoder. You will need to configure your definition to enable this, as per this link. There are no progress messages in the status bar. For multiple CV writes, programming may continue for some time after the "OK" appears. This has been tested with NCE and SPROG systems. Some DCC systems may need extra code, please advise if your system doesn't work. Some accessory decoders do not cope well with closely spaced commands and may miss changing some CVs with "Write All" or "Write Changes". The programming capability facade for handling indexed CVs has been improved to reduce the number of times that it has to write values to the "PI" and "SI" index CVs. Some decoders require that e.g. you write a value to CV31, then another value to CV32, then finally access the specific CV you're looking for. This can take a long time, especially when using a command station that writes slowly (see comment about DCS240 above) The indexed CV support has been updated so that it can skip writes when the previous operation was to an indexed CV with the exact same indexed values, and the command station didn't report any errors. This speeds things up greatly (can save over an hour when reading an ESU LokSound V4 decoder with a DCS240). This option is under user control, see above, and defaults to off. If a decoder cannot do this, e.g. the index values really do have to be written every time, that should be signaled by setting "skipDupIndexWrite" to false in the decoder definition, see the documentation page. Added the ESU SwitchPilot series. Added Heavy Load and Coast Mode logical functions as per latest firmware for the soon-to-be-released Full Throttle steam projects. Added the "Hornby TTS 9F 2-10-0". Replace the incorrectly named "Hornby TTS A4 4-6-0" definition with "Hornby TTS A4 4-6-2". Dave Sand fixed an issue with duplicate block connections when edge connectors are used. George Warner improved the rendering of rotated text. Use Traditional Pick Lists — The default option uses a text field where the system or user name is entered, such as a turnout or sensor. This method also provides a Pick List window with tabs for each type of object. Drag a name from the pick list and drop it on the name field. Use Single Pick Lists — This option also uses a text field, but the Pick List only displays the names for the current object, such as sensors. Clicking on a name in the Pick List will automatically copy the name to the text field. Use Combo Name Boxes — The Combo Box option changes the text field to a drop down combo box. Clicking on an item selects the name. Conditional Browser — A Browse option has been added to the Select menu for each Logix in the table. Selecting this entry will open a window that contains a formatted list of the conditionals contained within the selected Logix. The Logix help documents have been updated. Both of these were caused by errors in previous versions or manual changes to the panel xml file. After saving the xml file, the errors will not occur. Use Help >> System Console... to display the system console. When creating a conditional reference, the input field has been replaced by two drop down combo boxes. The first one is used to select a Logix and the second one to select the Conditional within the selected Logix. The Timetable sorting order can now be readjusted if needed. Simply reorder the table and the next time you open the Timetable window, the table order will be restored. Train and route departure times can now be set to one minute intervals. Previously, the menus only allowed departure times to within five minute intervals. The option to make backup copies of manifests now also makes backup copies of switch lists. Improvements to the Route windows. Now if a route is assigned to a train, and a train is built, you won't be able to modify the route until the train is either reset or terminated. Fixed some train manifest "time" reference bugs where the option to use 12 hour format was ignored. Also fixed a couple "time" bugs in the CSV file generation. Thanks to Dan Foltz for bringing these to our attention. Egbert Broerse added a new type of panel, Switchboards. They provide a grid of buttons to control turnouts, lights or sensors. Existing items will show their current state and allow you to toggle their state. This first edition includes German and Dutch translations. Proper display of new Roster Groups in the DecoderPro main window was fixed. The last modified date for Roster Entries can be correctly sorted. In some cases, the Roster Entry may need to be opened and saved again for this to work. Roster Entries are now saved with ISO 8601 formatted dates. The pane to create new objects was modernized, with tooltips and a handy JSpinner to set the number of items to add (see the Turnout Add/Edit help, Egbert Broerse). The Cmd column in the Turnout table, showing Closed/Thrown, was renamed State to align with the other tables. Egbert Broerse added the option to display the current state of Turnouts, Lights, Sensors and Blocks as graphics instead of text. It can be enabled in the Preferences > Display > GUI tab. Add two new script-based tools CombineTurnouts and CombineSensors for mapping a single Turnout or Sensor onto multiple pieces of hardware. Includes test routines which can serve as further examples. There are new SignalFollower.py (for SignalHeads) and SignalMastFollower.py (for SignalMasts) that lets you have one mast or head follow another's state. This can be useful, for example, if you have a repeated signal on the fascia. In the Signal Heads table, pick any of the valid Appearances from a combobox instead having to follow a fixed order. This change aligns the interface with the Signal Mast table. For developers, this interface element is reusable. The panes to add or edit a Signal Head were updated, with more tooltips and (translatable) warning dialogs. Now uses JSpinners to set IDs for a DCC Head. The function of Turnouts in use as outputs for a Signal Head are now stored as localized Comments in the Turnout table. Existing comments are retained until they are manually deleted, after which a change in outputs will be stored. After adding a new Head, the Name fields on the pane are emptied to help prevent using the same name again and receiving an error. Adding a Bachmann Acela Signal Head now requires an active system connection to guarantee the proper ID. The intention of the Home/Distant choice for a MERG head is explained in a clearer label and the items to choose from are adaptable per language. We've added a new jython/FollowSE8c.py sample script, along with a test case that shows you how it works. You can work with this if you want your SE8c Signal Heads listening to the layout and (attempting to) follow messages that are happening there, so that if something other than JMRI changed the SE8c-shown color, the JMRI icon(s) would follow. Output Matrix Signal Mastst are stored as a separate class in your configuration. Existing masts are automatically updated once resaved. Per user request, the Output Matrix Signal Mast connection can be configured using up to 6 outputs instead of 5. Editing of Signal Mast Logic from the Signal Mast Table has been improved. The Signal Mast Pairs panel refreshes to immediately show newly created source-destination pairs. The lists to set up Control items and their Conditions now look and operate like real comboBoxes. Configuring Signal Groups from the Signal Group Table has been fixed and a German translation added. The underlying code and xml were cleaned for readability and internationalization. Added a new package of tools for implementing USS CTC panels. Warrants normally grant rights of track access solely to only one train. It now is possible to allow several warrants to share portions of their route. A 'Clearance to Share Route' checkbox has been added for this. The Create/Edit Warrants help file was updated to explain the "Share Route" and "Don't Ramp" options. Implementation of these options was completed. A bug preventing restarts of cleared occupancy was fixed. New feature to upload new or updated Roster Entry xml files and images. At top of existing Roster page. Operations, Trains web page now auto-updates as trains are added, deleted or changed. German and Dutch (Egbert Broerse). Starting JMRI after changing Locale (language) in Preferences > Display gives a more informative warning in the Console. VSDecoder Manager can now be auto-launched at startup through preferences. New location for sound sets was added at https://github.com/JMRI/vsdecoder. New steam engine sound set Class64.vsd was added (provided by Klaus Killinger). For those connections which have the ability to monitor the bus traffic, the feature to save the monitor data to a file has been improved. If the tool is unable to access the log file, a dialog box will appear to inform the user of the problem. Monitor log files will default to be placed in the configuration profile directory, where in some cases, previous versions of JMRI could attempt to place the log file in the program directory. As before, the user may select a directory other than the configuration profile directory for storing the log file. This improvement affects the monitoring tools for many connection types. Added some additional tools for decoding and displaying NMRA DCC packets to the NmraPacket class. Behind the scenes, a lot of error handling and code documentation was added. Klaus Killinger improved the sound support. User Names entered by the user are checked for spaces at the start and end before they are applied. We expect this will prevent some hard to spot errors. This version of JMRI (and all later) writes a slightly streamlined version of panel file contents. Older files should still be readable by this version of JMRI, but files written by this version may not be readable by versions before JMRI 4.7.4 if they contain definitions of Blocks or OBlocks. This version of JMRI uses a new library to access serial ports, including USB serial ports. This is a major migration for JMRI, so please let us know if you encounter any problems connecting to your layout. See above for some steps you will have to take to update settings in the preferences. Improved the speed of loading panel files with lots of Sensors, Turnouts or Lights.